Scott MacMillan is a former freelance journalist who now works as a writer and communications specialist covering poverty and development issues for BRAC and BRAC USA, the organization’s affiliate in the US. He has spent most of his working life in developing countries, covering the transition from communism in central and Eastern Europe in the 1990s as a business journalist, then working as an editor and freelance writer in the Middle East. 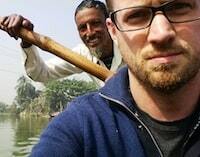 As a travel writer, his work has taken him throughout Southeast Asia, China, India, and Africa. His work has appeared in Slate, The Boston Globe, The Chicago Tribune, The National in Abu Dhabi, and now NextBillion. If you’re a subsistence farmer of potatoes, cassava or bananas, you’ll often sow your crops by taking cuttings from other plants. An alternative method of in vitro micro-propagation involves cloning plantlets in a laboratory setting. This can lead to dramatic gains in crop yields, but it’s expensive. But there may be a low-tech solution.